Diversity in Scedosporium dehoogii (Microascaceae): S. deficiens sp. nov.
Rainer J. & Kaltseis J. (2010). 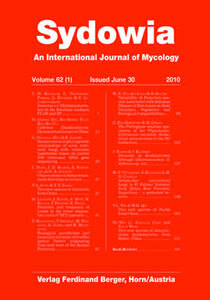 Diversity in Scedosporium dehoogii (Microascaceae): S. deficiens sp. nov. In the past few years a number of new Pseudallescheria (teleomorph) and Scedosporium (anamorph) species were described, among them Scedosporium dehoogii. This fungus was found frequently in the environment, whereas only a limited number of clinical cases have been reported. Some strains of S. dehoogii were re­cognised differing from the type strain in its ITS-sequences by clinicians during routine identification work. In an earlier work on the abundance of Pseudallescheria and Scedosporium in soil, a large number of S. dehoogii strains have been isolated. These strains grouped in two clades during sequence comparison of the ITS region as well as in the b-tubuline (BT2) gene. Differences were also found in the growth rates on polyvinyl alcohol agar supplemented with Diesel, rapeseed oil, and without supplement, in the colony appearance on oil-containing media and at 41 °C on PDA. Therefore the new species Scedosporium deficiens is proposed. Keywords: Human pathogenic fungi, Microascaceae, Scedosporium dehoogii, Pseudallescheria, new species, oil.